NVIDIA introduced their Quadro RTX line with an eye-poppin’ mix of high-end GPUs that put previous Quadro cards to shame and made workstations question their life choices. What seemed to be missing, however, was a mid-range RTX option. They introduced that last fall – the Quadro RTX 4000 – and it’s due… really, any moment. NVIDIA snagged one and shot it over so we could give you a first look and see what this GPU can do. At the time of this writing, I don’t have a tower workstation for the RTX 4000, so don’t have photos of it in its natural RAM-rich, storage-maxed, PCIe-ready, motherboardin‘ habitat. However… well, you should have seen that GPU all boxed up and static-sealed… it needed OUT. So, I took it to the country for fresh air and an introduction to some who seem to question/fear the power emanating from its sleek aluminum enclosure. 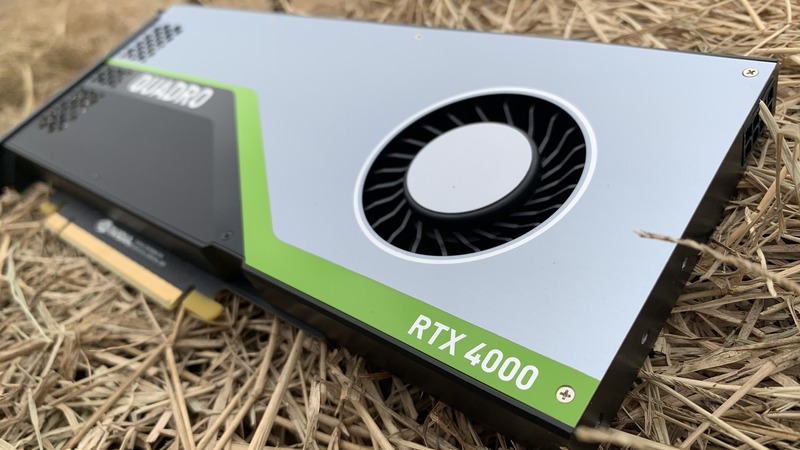 When the Quadro RTX 4000 was announced last November it was slated to be out December 2018. You won’t find it in the NVIDIA shop or in the OEM workstations quite yet but since it’s sitting here on the desk aaaaand enjoying time in the county you should be expecting it to drop soon. As you know, we like to have a look behind the design of products. It’s hard to imagine all that goes into the development of GPU technology but interesting to see a video from NVIDIA with a wonderful little glimpse behind the Quadro card scene. They explain the applications, the history, why the Turing architecture is so important and, with the testing put into it, perhaps explains why we’re still anticipating its release. The Turing architecture adds many important features over previous architecture, the primary of which is the new Tensor cores that add deep learning-based AI capabilities and the RT cores for real-time ray tracing acceleration. But there’s much, much more to Turing. It introduces a slew of new advanced shading features: Mesh shading to improve geometry handling performance, texture-space shading to cache shading results, variable rate-shading (VRS) to control shading resolution for specific regions, and multi-view rendering (MVR) that allows the rendering of multiple views in a single pass. The VRS and MVR have some very interesting applications if VR is of interest to you, with shading resolution based on eye-position and faster rendering of VR scenes. If you want deeper into the Turing rabbit hole, I absolutely recommend a quick read of the 86-page Turing GPU white paper. NVIDIA RTX platform. This platform provides various RTX APIs for developers which allow them to build RTX applications that take advantage of the RTX Turing architecture which allow you to take advantage of those RTX features in applications that take advantage of NVIDIA’s line of RTX GPUs. It’s a big RTX love fest and you’re invited. 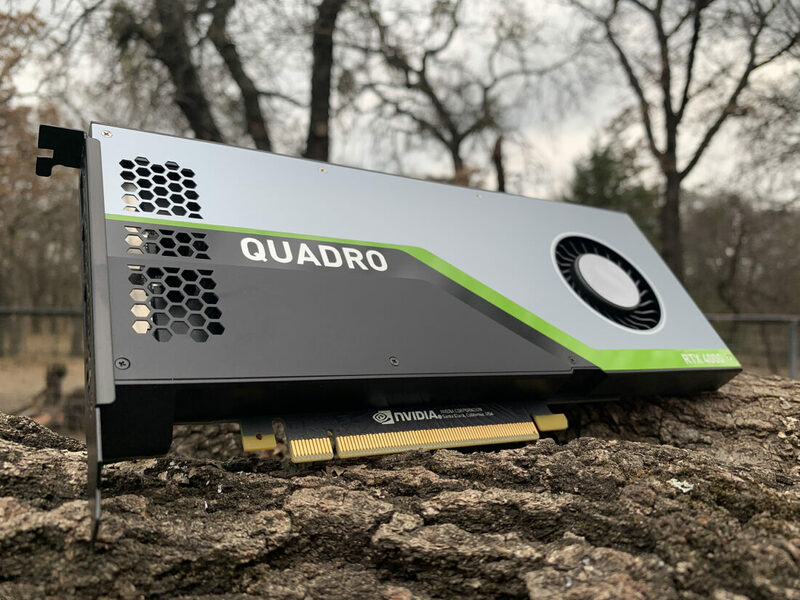 To date, there are 14 Turing-based Quadro GPUs and four in the Quadro RTX line. The Quadro RTX 4000 leads the pack followed by the RTX 5000, 6000, and 8000. 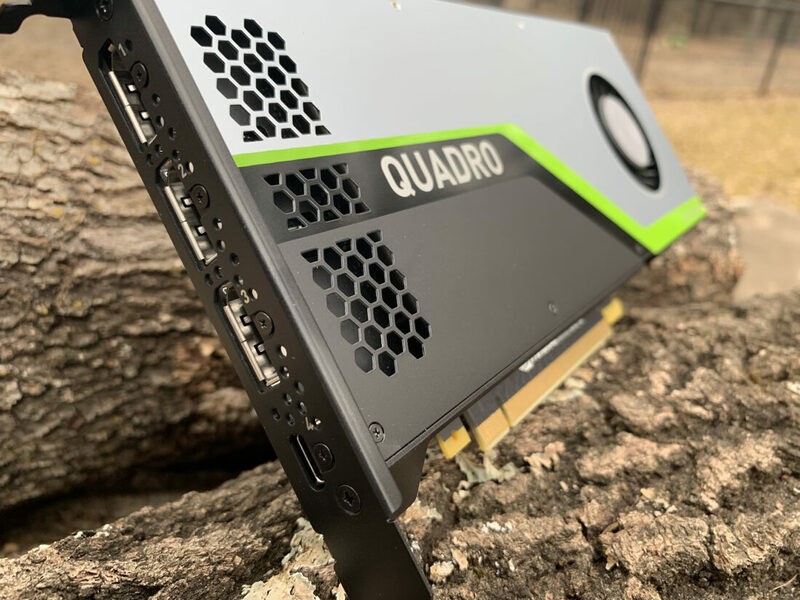 If you’re familiar with older generation Quadro cards, and GPU specs in general, you likely evaluate it on GPU memory, memory bandwidth, CUDA cores for NVIDIA cards, and perhaps display connectors/support and power consumption. The RTX cards add some new specs you’ll want to get familiar with, namely the count for the Tensor Cores and RT Cores I mentioned earlier. Now, unless you’ve sprung for an RTX 6000, you’re likely on an older P(ascal), K(epler), or M(axwell) series Quadro card. All previous Quadro cards lack the Turing RT Cores and Tensor Cores. Also to note, the peak memory bandwidth of the RTX cards start out at 416 Gbps for the RTX 4000 while the P-series maxes out at 432 Gbps for the P6000. 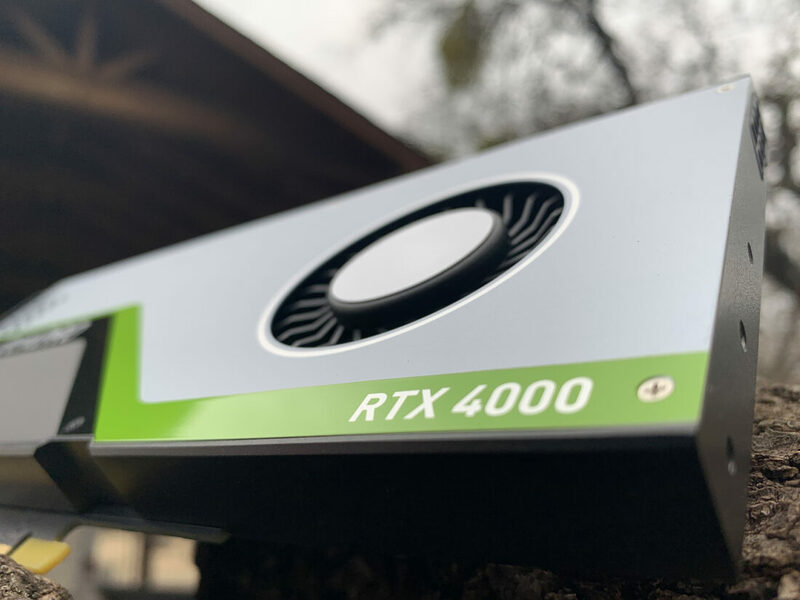 While it’s a leap from a direct comparison, the Quadro RTX 4000 is considered a mid-range card that pops in at the same 8 gigabitties (GDDR5) of the mid-range Quadro P4000 which also has much lower memory bandwidth and CUDA core count. 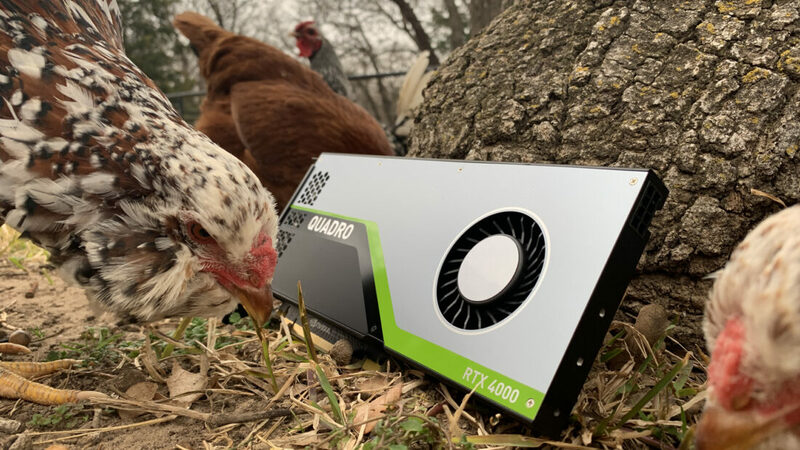 So, I hope that gives you a sense of what we’re dealing with in the new Quadro RTX line. I have a Lenovo P520 Tower (with a Quadro P4000) I’ll put the RTX 4000 card into for some testing and *ahem* better photos. Having seen what a Quadro RTX 6000 can do, I’m anxious to see what a card with 8GB of GDDR6 memory (1/4th that of the 6000) is capable of and also how it compares with the Quadro P4000. Once I go a few rounds, I’ll post my finding. Until then, let me know what questions you have about the Quadro RTX 4000 and I’ll do my best to answer them. 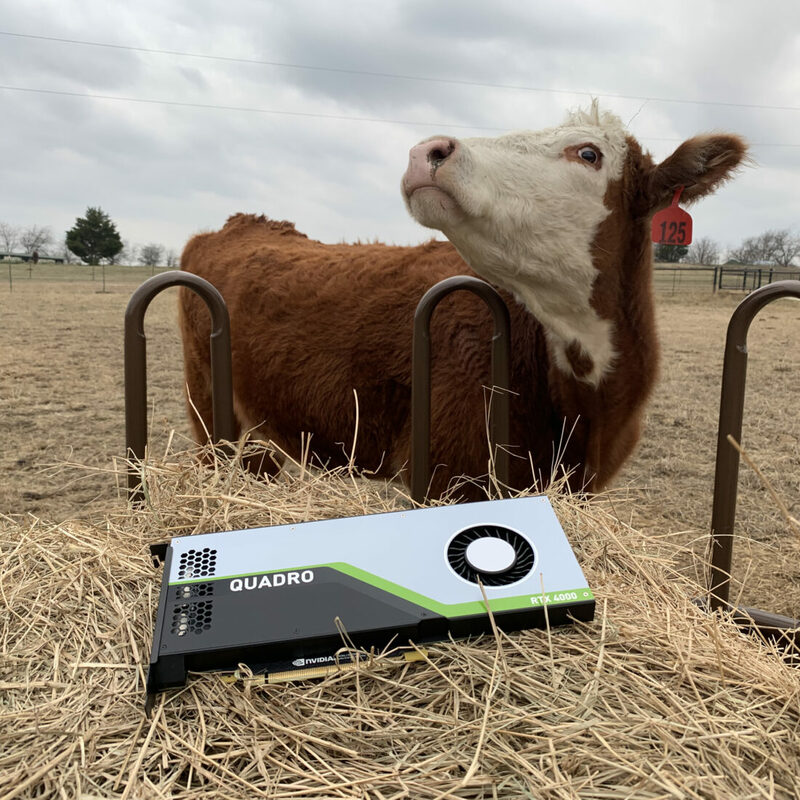 If you haven’t had a chance to see the new NVIDIA GPUs in action, and you’ll be at SOLIDWORKS World 2019 next week in Dallas, Texas, NVIDIA and their partners, both software and hardware, will be featuring their capabilities. I’m particularly interested in the range of applications the Turing tech holds for CAD/CAM/CAE software. Oh, and keep an eye on the Quadro RTX 4000 page for new info and to get a notification about its availability.